A New Series of Microscope Objectives. Paper II of this series demonstrates that spherical lens elements combined with spherical mirrors may provide well-corrected and achromatized ultraviolet microscope objectives. 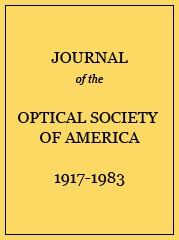 The present paper presents a further study of several types of catadioptric Schwarzschild systems which provide microscope objectives relatively easy to construct, convenient to use, and for which ultraviolet and visual range performance characteristics are not compromised. Several modifications with numerical apertures within the range 0.4 to 1.0 are presented.